There were once so many Shumates in Martinsville that the town literally depended on them to run. They occupied positions from city treasurer, assistant to the court clerk, policeman, railroad clerk, merchant and government activist, real estate developer, and so on. Their story begins in the 1800s not in Martinsville itself but near Bassett in Henry County. John Wesley Shumate was born in the Reed Creek district of Henry County on October 8, 1853, the son of the Daniel and Elizabeth Pace Shumate. He married first Martha Ann Wells and had a number of children. Martha died in 1896 giving birth to her son Whitney Shumate. John Wesley married again to Susan Ann Philpott and had more children. 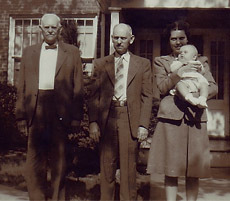 Pictured here, left to right, are John Wesley Shumate with his son George Marion Shumate, granddaughter and great grandson, Lit Maxwell. Early on Mr. Shumate was a farmer; he later became associated in business with E.J. Davis, tobacconeer. He moved to Martinsville City in 1911 and, at the time of his death in 1949, was survived by 11 children, several children having died young. He had been an active member of the College Street Primitive Baptist Church. He was noted in his obituary as being a lifelong Democrat and having cast 19 consecutive ballots for the Democratic nominee for president over a span of 75 years. His first vote was for Samuel J. Tilden and his last one for Harry S. Truman.